Popular kids - they aren't always the nicest ones in school. We've seen the story told over and over in teen movies and if we give ourselves permission to remember, we'll know that it happened when we went to school too. Optimist Clubs are great at recognizing students for doing remarkable things and many think it is especially important to find those that excel in areas other than athletics and grades. Every child is different; every person has individual strengths and weaknesses and some will inevitably be outsiders. According to Alexandra Robbins, that's okay. What a great message to send to students everywhere. What is your Optimist Club doing to help students fit in, or to be comfortable in just being themselves? Please leave a comment ant tell us all about it. Optimist Clubs love a parade, especially when it is a day to be thankful and patriotic. After all, nothing is more American; nothing says hometown more than a parade. In combination with the R.O.T.C. 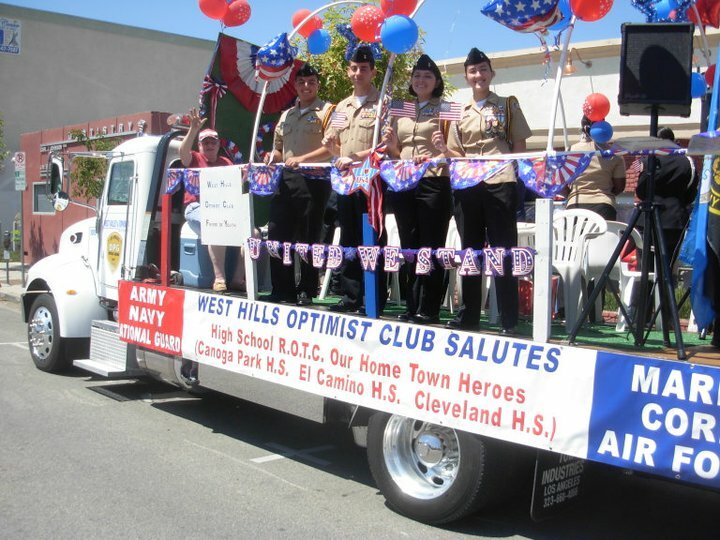 programs at Canoga Park, El Camino and Cleveland, High Schools, the Optimist Club of West Hills, California saluted the fallen during the Memorial Day Celebration. A simple float, a simple message that means so much to so many. Thank you. In January, Newsweek proclaimed that Grand Rapids, Michigan was a dying city. The city responded by making this awesome video, a record-setting lip sync project of American Pie. I can't imagine a better post for Music Sunday. It's full of memories - perfect for a holiday weekend when we gather with friends and families and share stories, old and new. It's full of pride - perfect for patriotism and commitment to our local communities that are demonstrated by Optimist Clubs every day. It's full of hope - hope is optimism in action. And my favorite - The working title is "The Grand Rapids LipDub," but its message is "Experience Grand Rapids." I think you'll Experience Optimism too. Enjoy. Shout out to The Friday Awesome on The Maddow Blog for leading me to this YouTube video. Childhood obesity is a major problem in the United States. As technology makes it easier for students to be more sedentary, it becomes more important for adults to help them find ways to stay active. Not everyone is an athlete, but everyone can benefit from a little athletic training. 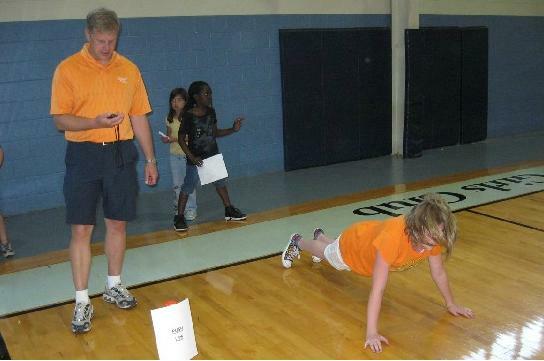 That's part of the appeal for the Optimist Club of Knoxville "Boys and Girls Club Fitness Authority" program. 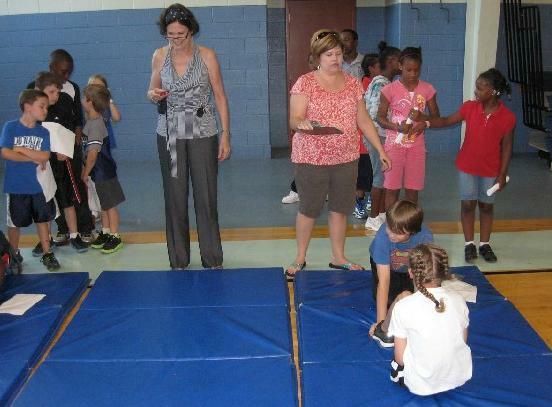 Members at the Boys and Girls Club are encouraged to take part in activities that help them learn about sports culture and history, nutrition and physical fitness. Next, they participate in simple tests of endurance, flexibility, and strength. The Optimist Club is there to help measure their fitness level and encourage participation and elevate the children's self esteem. Photos for push-ups, sit-ups, and the awards ceremony are shown here. 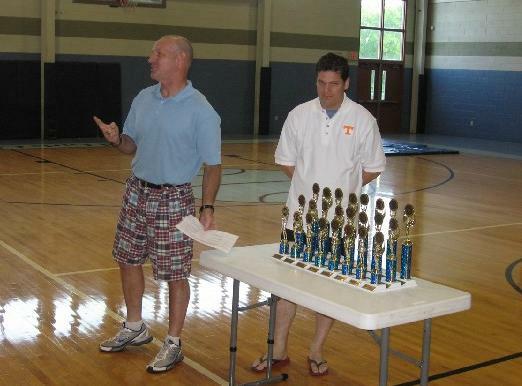 See more pictures at the Optimist Club of Knoxville website. 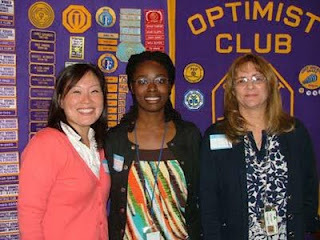 Optimist Clubs rush to get many of their programs completed before the end of the school year. That may seem odd, as children really need things to do and places to go in the summer months. However, it is easy to engage with them while the students are still in session. Sometimes the school or school district can be a big help, and that is exactly the relationship between the Optimist Club of Jerome, Idaho and the Jerome School District for the Special Needs Fishing Derby. The school's role: they provide the buses to get the kids to and from the event. 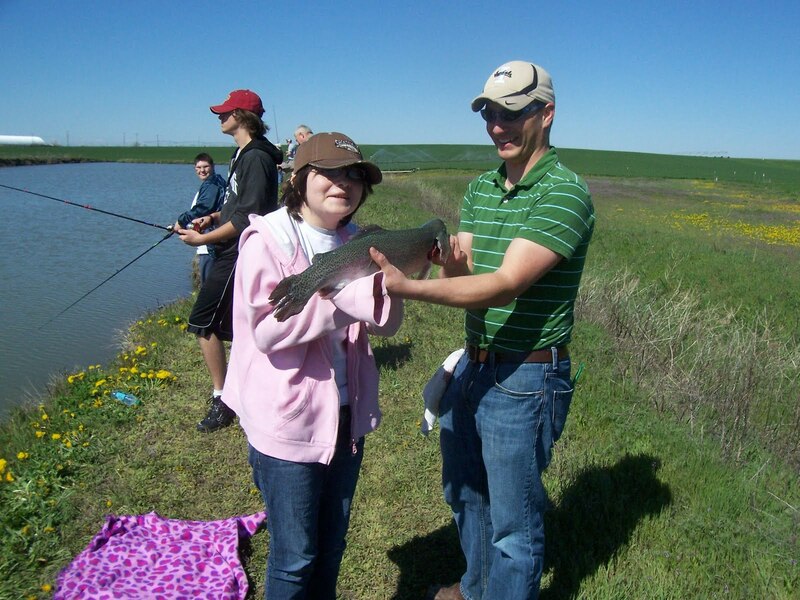 The Special Needs Fishing Derby is a free event to students of all ages with physical and mental disabilities in the Jerome area. It is the only field trip for the special needs students in the Jerome High School. The students, with the help of paraprofessionals, aides, and volunteers, fish for the day making all the noise they want. They bring their lunches and at the end of the day, take home their catch. 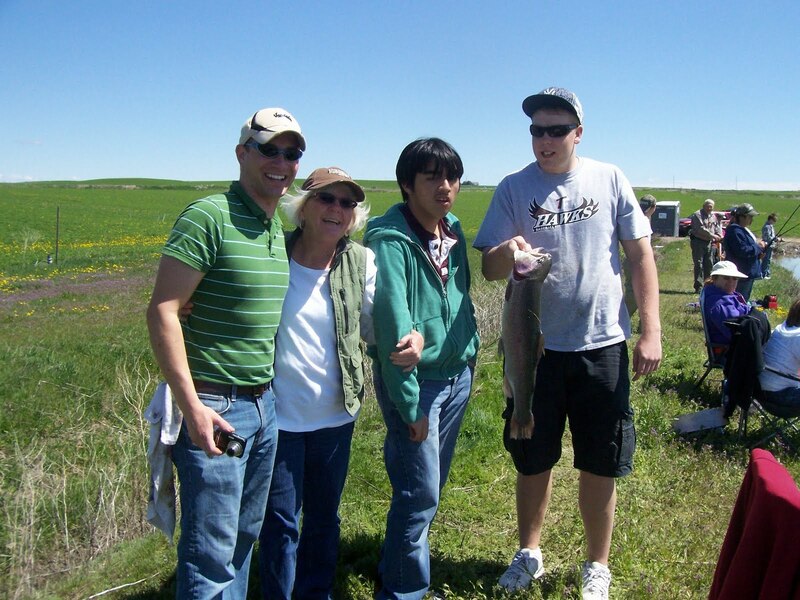 The pond is stocked with local trout that range up to 6 lbs. in size! All poles, hooks, sinkers, worms and bottled water are provided for free. The primary goal is to make sure that each child catches a really big fish! It is also a goal that this project does not cost the Jerome Optimist Club any money as members want this to be a project that finds support, donations and volunteers in the community. The Special Needs Fishing Derby began in 1975. Optimist Club member E. P. Martin, deceased, donated the use of the pond on his farm for a special day. Seeing how much fun the children had that day inspired him, his family, and the Optimist Club to return every year since. The event holds a special place in the hearts of the members of the Jerome Optimist Club. It holds an even bigger place in the hearts of the children and their families. What a great display of "Bringing out the Best in Kids." More information is available at JSD Special Education. 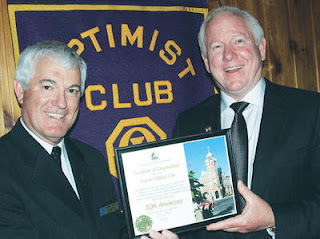 On June 12, 1961, thirty-nine men came together to form the Optimist Club of Arnprior, Ontario. On Saturday, May 21, 2011, the community came together to celebrate the club's 50 year anniversary. Over the years the Arnprior Optimist Club has given, by a conservative estimate, at least $2 million to the community. They support schools for academics and sports, participate in graduation exercises, assist children with special needs, sponsor hockey, dance and wrestling clubs among many others. In the community they participate in the Winter Carnival, Bike Rodeo, Canada Day and built the Optimist Baseball Diamond. Currently, the Arnprior Optimist Club has pledged to raise $100,000 for the Arnprior and District Memorial Hospital Partners in Caring Campaign. President Robbie Burton remarked during his formal presentation, "We should all be proud." Yes they should. Special recognition went to long-serving members including Charter Members Lorne Bretzlaff, John Scardino and Peter McLaughlin. Shown in the picture are Arnprior Mayor David Reid and Arnprior Optimist Club president Robbie Burton. 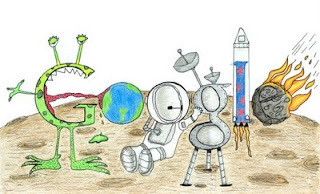 Absolutely one of my favorite contests, Doodle for Google catches my attention every year. To see the imagination and talent of young students is inspirational. This year the big prize, to be on the Google home page for a day (May 20, 2011) went to Matteo Lopez, 7, of South San Francisco. Additionally, he will receive a netbook, $15,000 college scholarship, and $25,000 technology grant for his school. There were 107,000 entries this year from K-12 grade students in the United States. 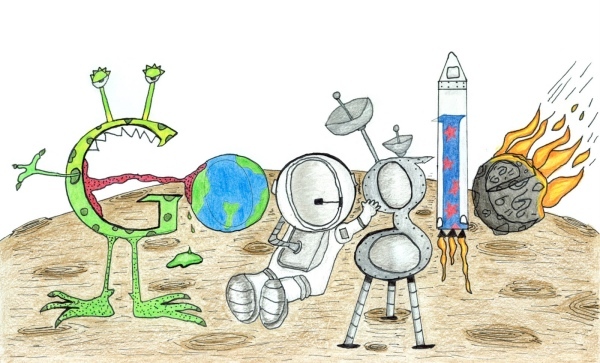 See more entries at http://www.google.com/doodle4google/vote.html and enjoy the regional finalists interpretation of "What I'd Like to do Some Day." Optimist Club members have many talents and I'm so happy to call so many of them my friends. About two years ago I had the good fortune to meet a talented gentleman, Bill Myers. Bill, who currently resides in Indianapolis, Indiana, was serving as the President of the Optimist Club of Indianapolis, the oldest Optimist Club, holding the first charter from when Optimist International was officially incorporated. Bill is a legacy member for the club, following in his grandfather's and father's footsteps to lead. Bill is also, as his YouTube handle IndyProducer acknowledges, a producer and entertainer. Through his connection with Optimist Clubs, he has visited Barbados to perform and engage with other Optimist Club members and students who they work with. In April, he was invited to participate in a fundraiser concert for the Barbados Cancer Society in honor of the late Prime Minister, the Honorable David Thompson. I enjoyed the funky sounds so much, I had to share them here with you for Music Sunday on Experience Optimism. Please enjoy 'Bah Duey Duey' with Bill Myers and the Fellas. Optimist Clubs are known for recognizing children. Aside from parents, no one has more of an impact on children than their teachers. That is why the Optimist Club of Newark, California decided to honor teachers everywhere at the club meeting on Tuesday, May 17, 2011. The presentation, led by President-elect Russ Blowers and Teacher of the Year event chairperson Denise Fullerton, began with club members sharing memories of their favorite teachers. Members discussed how they remembered different history, math, English, and literature teachers, but the most important part of the memory was how they helped each individual overcome shyness, make friends, and lead. What a wonderful lead-in to the main event where Milani Elementary School Principal Dr. Le Kimbre Brown enthusiastically praised the honorees, her fellow staff members, Yoon Chi and Janine Friend. Yoon Chi was named Teacher of the Year for making a lasting impression on her students and being a staff leader. Janine Friend was named Classified Employee of the Year for being the "ultimate nurturer" to students in the school's resource center. The honorees received flowers, gift certificates and praise from the Newark Optimist Club and Dr. Brown accepted a Staples gift certificate for the school in honor of the faculty and staff achievements. Thanks to The Informer newsletter editor Marla Blowers for the story and pictures. Are you training or teaching? I recently heard a charter school principal talk about what makes her high-performing school different from other schools, public and private. The word she used repeatedly was train. We train our students to perform community service. We train our students to be respectful. We train our students to do well on tests. I asked, "But I thought the role of education was to teach, to give students the knowledge and ability to make wise choices of their own volition?" She responded, "How do they tell a wise choice from a poor choice if they haven't been trained to identify the difference?" And so goes the continuing dialogue that I have with myself regarding the difference between training and teaching. Months ago, before I heard this passionate school administrator speak, I asked Quora, "How does training differ from teaching?" "Training is focused content to get people to perform a specific task, in a specific environment, under specific conditions to achieve a specific outcome. Teaching is content given to people in which they use it to create outcomes - expected and otherwise - in all sorts of different conditions and environments." Using this definition, it is easy to imagine the charter school in question is training its students to perform well in school-based situations. What happens when the environment changes? We won't really know how well these students do in world situations until they are grown; but I can tell you based on the scores she shared with us, and the involvement that I see the students have in the community, they are outstanding young citizens today. Over the last ten years, Optimist International has focused on training members. 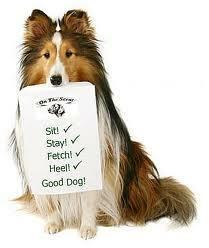 They have even gone so far as to create an elite group of Certified International Trainers. In order to become a Certified International Trainer, one must first pass through series of workshops, lead sessions at the club and district level, and then be invited to train with another at the International Convention or other setting that the group feels appropriate. I usually don't mind such a program, but for some reason this one kind of irks me. You see, I don't believe we can train people to be leaders. I also don't believe we can train people to be entrepreneurs, but I have always believed that we can train people to be good managers. We can train people how to complete and file paperwork, when to hold a meeting, and what the steps are to complete a task. When we are children, or apprentices, perhaps the training model works. I fear, however, that training falls very short of empowering others to lead. Training is not a succession plan. And we need a team to champions - or to use the social media vernacular - fans to promote the up-and-coming leader. An influential person has to recognize and support that the new leader is ready to take control. I do hope that the training mission of Optimist International will evolve. It's a good start, but it is not a continuum. Training does not inspire me to ask a new member to join my club or to start a new Optimist Club in a neighboring community. Training is not the reason I attend a meeting. I do all of the above because I feel that when I engage with others, together we can make a difference in our communities that is greater than any of us can do alone. That is a feeling, an emotion, a desire, that cannot be delivered through training. Optimist Clubs inspire respect for law and to do so, they honor police officers and invite them to participate in many activities throughout the year. Projects like "Shop with a Cop, "Bike Safety Rodeos," and "Child Safety Days" help children understand that police officers are friendly and approachable. Police officers are there to listen and help. Of course police officers must also enforce the law; that is their job, and sometimes a thankless one. So many Optimist Clubs choose to hold a recognition day to say thank you to the officers in their community. This video comes from WTOC news in Savannah, Georgia where three officers and a detective were honored for keeping the streets safe. Click here for a press release of the event from the Savannah Chatham Metro Police. Saying thank you goes a long way, don't you think? 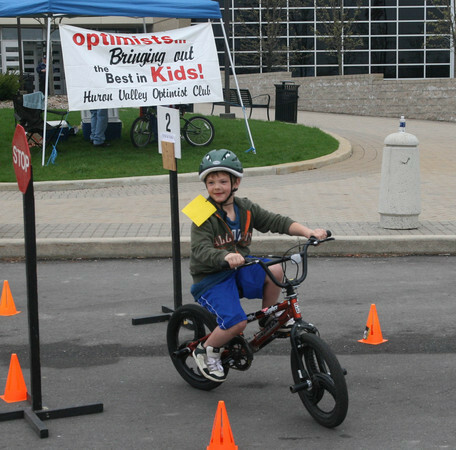 One of the many projects conducted by the Optimist Club of Red Deer, Alberta is the Bike For Kids Program. Since its inception, Ken Williamson and his fellow Optimist Club members have refurbished and given away over 300 bicycles to children. Ken is the driving force behind the project. He explains that there are many Canadian families that do not have the resources to provide their children with bikes. The problem is compounded because kids grow out of them quickly as well. The Optimist Club receives bikes from the community to fix-up and redistribute and so far this spring, they have given away fifteen bikes. Ken says that more are needed, especially adult sized bikes to give to older children as they grow out of their youth bicycle. Donations may be dropped off during regular business hours at the Sunnybrook Farm Museum, 4701 30 St., Alberta. To learn more about the program, you may reach Ken at 403.318.5803. Click here to learn more about the Optimist Club of Red Deer. Music Sunday: Why Can't We Be Friends? Over the weekend, I visited the Optimist Youth Home and Family Services, and the Optimist High School in Los Angeles, California. I was there as part of the Pacific Southwest District Meeting; a one-day activity to provide education and inspiration for Optimist Club members, but meeting at the Optimist Youth Home was inspirational in itself. The facility, founded in 1906, has been supported by Optimist Clubs in California since the late -1920s. Optimist Club members volunteer at the Home, serve on its Board of Directors, are involved in fundraising, and make philanthropic donations. It is one of the largest examples of living the Optimist International motto, "Friend of Youth" and inspired me to choose today's Music Sunday song, 'Why Can't We Be Friends?' This version, from Bridge to Terabithia, reminds me of diversity and how important it is to reach out to others. Enjoy. Recently in Farmington Hills, Michigan, the East Middle School Jr. Optimist Club conducted a community service project for the Salvation Army. 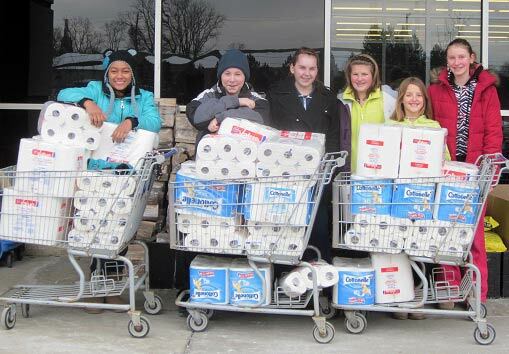 Their goal was to go on a shopping expedition to help stock the shelves for people with needs. As you can see by the picture, paper products were the product of choice. Any grocery shopper can tell you how quickly toilet paper and paper towels can eat up a tight budget. In another example of how a simple project can make a difference, this thoughtful gift from the students will be well received. Photo credit: Farmington Hills Optimist Club website. Click here to find out more about JOOI Club projects and the Farmington Hills Optimist Club. We all enjoy professional videos; that's why the movie industry continues to thrive as we hand over mega bucks to see the latest stars and stories on the big screen. However, today, we can all be videographers. The tools and resources are there for anyone who wants to give it a try. Take a look at this 23-second clip taken at a recent gathering in the Pacific Northwest District - Optimist International where Judi Van Cleave was happy to give a plug about her Optimist Club and the Oregon City Pioneer Family Festival. All you need to make this happen is a handheld video camera, a YouTube account and person who is passionate about the cause. Oh, and please remember the wise words Brian Solis gave to attendees at the School of WOM, "Keep it significant and shareable (K.I.S.S.)." I find that I'm much more willing to watch, and share, a short video than a long one! 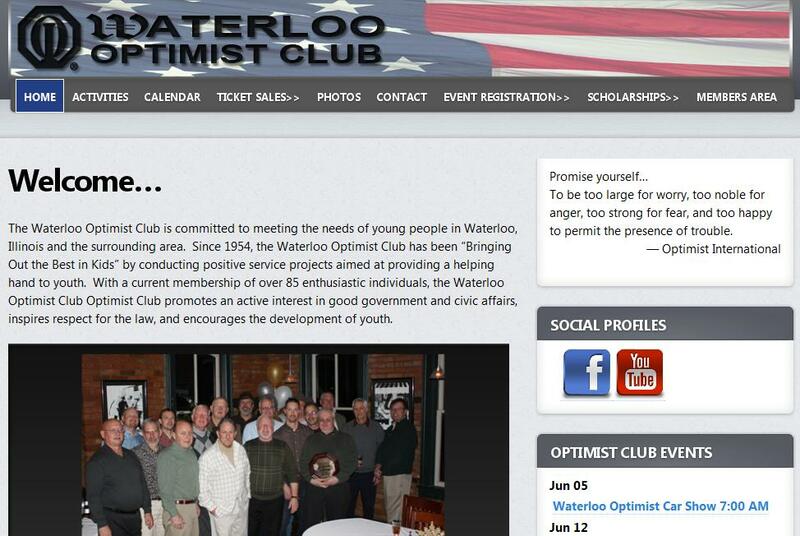 The Optimist Club of Waterloo, Illinois has a new website. It was built with a WordPress theme by a professional web designer and allows visitors to not only see what activities the club engages in, but also to register online and buy tickets for the large events. It is organized in a way that gives you every opportunity to be a participant in the activities offered by the Optimist Club. Take a look at the Activities page as an example. There is something for participants to do every month of the year. Next, head over to the Scholarship page and you are able to download an application for you or your child to complete. Scroll down on any page and you'll even see a widget asking you for a donation to the Waterloo Skate Park and a thank you for JV's Bar and Grill for years of great food and service. 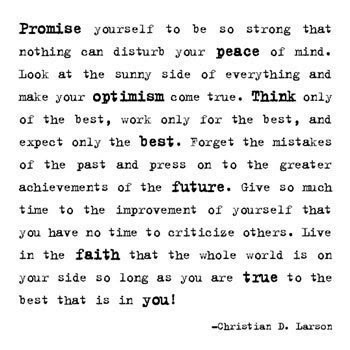 There are also widgets displaying videos from Optimist International and optimistic quotes and thoughts of the day. To be fair, there is a contact page where one might ask such questions, but it is an impersonal form with a pesky captcha phrase needed in order to complete. It seems a shame to have created such an informative website and yet still be unapproachable. Monday morning tip: Please take a look at your website today and make certain that your club is as welcoming to new member volunteers as you are to participants in your activities. Make it easy to visit and join your Optimist Club. Your fellow members will thank you for the help and future generations will thank you for the legacy of service. If you would like to visit the Waterloo Optimist Club, they meet on the 2nd and 4th Thursdays, 6:30 p.m., JV's Downtown Bar and Grill, 117 N. Main Street. It's good to think about family on Mother's Day. One of my brothers was a musician, and following my mother's death twenty years ago, he confessed to me how hard it was to perform nightly in the lounge act that he had created. "Do you know how many songs have 'mother' in them?" he asked. When I thought about writing this post, I thought maybe I would look for a few of them and include them here. 'Up Against the Wall, Redneck Mother,' is one that specifically comes to mind as comic relief of that particular discussion. As funny as that might have been, I decided to be more respectful and inspirational, if not a little melancholy. One of my mom's favorite songs was 'Bridge Over Troubled Waters,' by Simon and Garfunkel. I grew up listening to it with her, on the stereo, on the radio, and in the car, cranked as loudly as it would go. After her death, I wondered why that song played such an important part of her life. Listening to the lyrics today, I think perhaps it was to remind me, and all those who still hold her so dear, "If you need a friend; I'm sailing right behind." It is with thanks and love that I make this Music Sunday post today, for my mom, and for mothers and children everywhere. Sometimes our mothers stay in the background pushing and hoping. Sometimes they go ahead and light the way. But they are always our dearest and most honest friends and with their optimism, we learn and proceed on our own. Direct relationships. According to Mitch Joel from the Six Pixels of Separation blog, businesses and brands need direct relationships in order to survive. Katya Andresen of Katya's Non-profit Marketing Blog picked up his story and related the words to nonprofit organizations. She said, "People usually support a cause because of a deep, personal, emotional connection with it or the person who asked them to help the cause." Does this sound familiar? Have you heard it all before when recruiting new members to your Optimist Club? Do you cover the same ground when you try to keep those members coming back year after year? Developing relationships is not a new concept. Churches thrive on the model, as do communities, chambers of commerce, businesses and yes, service clubs. The question is, why do some do it better than others? According to Joel and Andresen, some do it better because they have the tools. I say some do it better because they have the personality. Direct relationships require engagement. Constant engagement. For service clubs and churches, that means the leader has to provide a reason for their members to show up regularly. For businesses and organizations, it means the same thing. Consider this: your club, business or organization is a constant party, and you are the host. A good host makes sure her guests feel welcome; she gives them a great experience and something to look forward to on their return. It's hard work, and being sociable is only part of the equation. She also painstakingly crafts her guest list, menu, decorations and entertainment to make it appropriate and enjoyable for her participants. You have to do the same thing every time you open your doors for a meeting or for business. Make it an event and your guests will tell others and invite them to come along. Make it personal and you will find your guests, friends and their followers will do more than just show up; they will pay to have the experience over and over again. 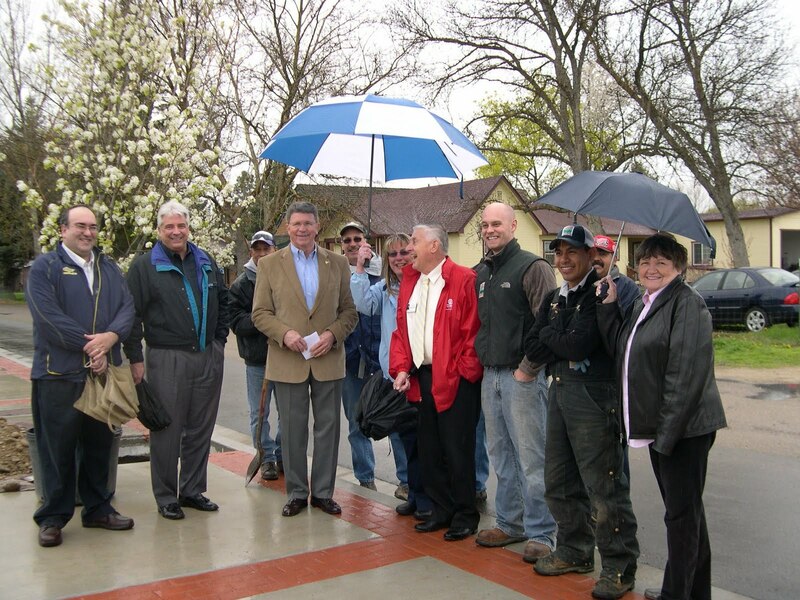 It was a rainy day in Eagle, Idaho, but that did not prevent Mayor Jim Reynolds from proclaiming the City of Eagle a Tree City for the 19th consecutive year. 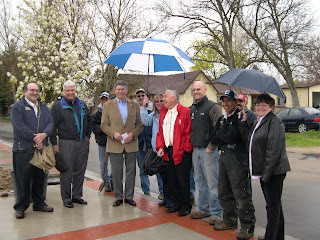 The City used the opportunity to highlight a tree donated by the Eagle Optimist Club. The Eagle Optimist Club chose to donate a tree in honor of their first successful Christmas Tree fundraiser. According to Ben Gard, Vice President and Project Chairman, it was a good way to give back to nature and the community. "We plan to do this every year," he said. Does your Optimist Club give back in such a simple way? Sometimes it is the small projects that make the most impact. That Chanticleer Pear Tree, chosen by and planted by the City, will last for many generations to come. With the school year drawing to a close and the days getting longer, it's time for children to take to the streets on two wheels. Bicycle wheels, that is. That is why bicycle rodeos are very popular with Optimist Clubs. Some call the program Safety on Wheels, while others add in activities like personal safety, internet safety and child identification to make it a full day of safety activities. Like the sign in the picture, the idea behind safety programs is for Optimist Clubs to help "Bring out the Best in Kids." Add in "With hope and positive vision, Optimist Club members bring out the best in children" and you've got the Optimist International mission statement in one sentence. Don't you want to get involved in such an active pursuit? Click here to find an Optimist Club near you. 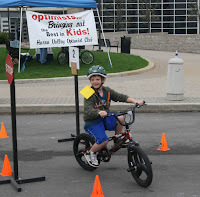 Photo credit: Chris Wall Please click to see more pictures and read about the Huron Valley Optimist Club Safety Day in the White Lake Patch. On April 28, the Optimist Club of Casas Adobes, Arizona held its third annual First Responders Recognition Dinner. As one might imagine, this activity took on special meaning as the community and entire country had recently witnessed their expertise in the tragic Arizona shooting that injured Congresswoman Gabrielle Giffords, wounded thirteen others, and claimed the lives of six including a nine-year-old girl. Dan Marries, anchor with Channel 13 KOLD, Marana, Arizona and a member of the Casas Adobes Optimist Club, created the video tribute and posted it on the KOLD page on April 29. He also emceed the event. Please click on the link to read more and see those honored by the Optimist Club. One of the purposes of Optimist International is to inspire respect for law. Optimist Clubs choose to do this in a way that is meaningful to their community. First responders seem like a natural fit for the Casas Adobes Optimist Club as they are a hands-on group, at the ready to serve. 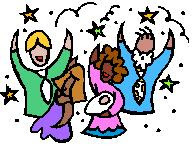 The home page of the Casas Adobes Optimist Club even explains this as they "insist on being physically involved" with activities they support and that is a very commendable trait. Thank you for your service. Please don't be shocked. And please don't click away. That's right, I have chosen the original version of the Cee Lo Green song "F**k You" to play right here on the Experience Optimism blog for Music Sunday. I could have chosen the clean version, "Forget You," but as I listened to the slight variations, and debated between the two, I decided that sometimes it's okay to display a little attitude. A little four-letter word will not prevent me from enjoying the emotion and true meaning of this song. A little four-letter word will not prevent me from accepting this artist's style and genius. Now it's time for me to confess; I am a new Cee Lo Green fan. Until this week, I had ignored this grammy-award winning artist because he caused controversy with his unflattering words. I thought, what's the point, there are too many other people to listen to. I'm not afraid to say that it is also possible that I ignored him for other reasons, like he looks different than me. Or maybe I just hadn't paid attention because I was listening to the wrong radio station, but my eyes and ears are open now and I'm enjoying the Cee Lo experience. My questions for you today: What are you missing because your eyes, ears and mind are closed? Are you channel-surfing enough to keep current? Are you stopping at the different stations in life to appreciate what each has to offer? We live in a beautifully diverse world. Many preach tolerance. I have decided, from today forward, to preach acceptance. It's a little different because tolerance allows you to ignore those you disagree with; however, when you accept someone or something for who or what they are, you have to be aware, really aware of them and what makes them a part of the world in which we live. Acceptance brings about awareness and understanding and I believe that will make the world a better place to live. Dare I say it? Yes, acceptance leads to peace and happiness.